Finding the most appropriate medium sized business anti spam filter can present a problem. Naturally you want the highest level of protection against spam email and email-borne threats, but you do not want the savings you make in productivity – and from having a malware-free network – to be swallowed up by the need for additional IT resources. Consequently, the best spam email filters for SMBs are not necessarily the “top-rated”. There are different types of spam filter that operate in different ways. There are also different ways in which a medium sized business anti spam filter can be deployed – as a hardware solution, as a software solution, or as a cloud-based solution. This article looks at the different types of spam email filters for SMBs, how they operate and the three most popular deployment options. The article also highlights some of the important features that you may wish to consider when evaluating the options for a medium sized business anti spam filter to ensure you implement an effective filter that does not place a strain on your IT resources. Every email service (Outlook, Gmail, Yahoo, etc.) has some sort of spam filtering mechanism that detects and junks spam. However, due to the volume of spam being distributed, a certain percentage still gets through. This is because spammers are constantly finding new methods of circumnavigating the spam filtering mechanisms, and the email services´ filters are updated retrospectively. A medium sized business anti spam filter uses the same front end mechanisms to detect “known” spam, but also uses Bayesian Analysis and Greylisting to identify spam from new sources. These features eliminate practically all spam from reaching your employees´ inboxes without preventing genuine emails from reaching their destination. Spam email filters for SMBs also include antivirus software with phishing protection and malicious URL blocking to inspect each incoming email for email-borne threats, and mechanisms for scanning outgoing emails for spam and malware. The outgoing scans are important because they detect any content that may be interpreted as spam by an over-zealous spam filter, which may lead to your company´s IP address being included on a global blacklist of spam sources. Hardware, Software or Cloud-Based Deployment? The choice of whether to deploy tour medium sized business anti spam filter as a hardware, software or cloud-based solution may depend on your personal preferences and the nature of your business. Typically hardware solutions have their own operating systems that have to be updated individually, can be difficult to manage for optimum performance and lack scalability if your business grows. Anti spam software solutions are more scalable and are usually compatible with every type of network system. Software spam email filters for SMBs are installed between your firewall and your mail server. They can be managed via a web-based portal, are updated automatically, and provide a mail continuity service if your mail server experiences an outage. A cloud-based medium sized business anti spam filter is hosted and updated in real time by a service provider. Implementation of the filter requires just a simple adjustment to your mail exchanger (MX) settings so that all your incoming and outgoing emails are directed to the service provider before those that are spam-free continue their journey to the intended recipient. The ease of use of managing the medium sized business anti spam filter. The percentage of false positives – i.e. the number of genuine emails that get blocked. The reporting options available to identify false positives and whitelist senders. Whether outbound mail is also inspected for spam and viruses (not all filters do this). The quality of the anti-virus software protecting the organization from malware. The best medium sized business anti spam filter should also offer businesses the choice of how email is treated and reported. You should have the options of tagging, quarantining or deleting based on the degree of spam an email is considered to have, and have options to customize these options is you wish. Outgoing mail filtering and a mail continuity service are essential, while Greylisting is recommended to detect new sources of spam. 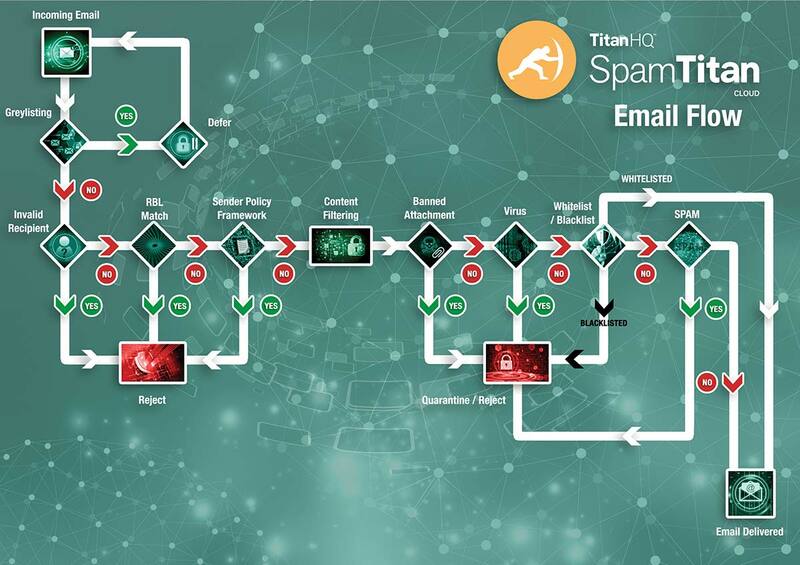 As SpamTitan´s spam email filters for SMBs are designed for ease of use, we only offer the options of a software solution – “SpamTitan Gateway” – and a cloud-based solution – “SpamTitan Cloud”. By integrating robust front end detection mechanisms, Bayesian Analysis and Greylisting, both spam email filters for SMBs detect 99.97% of spam email with a low false positive rate of just 0.03% according to the leading independent testing and certification agency – VB Bulletin. Comprehensive reporting options exist to advise network administrators of detected spam and malware, with dual antivirus protection being provided by two of the leading anti-virus platforms in the industry – Bitdefender and Clam AV. However, not only is SpamTitan an effective medium sized business anti spam filter that will not place a strain on your IT resources, but we are also offering businesses the opportunity to try our solutions for free. Our offer to try a fully-enabled medium sized business anti spam filter free for thirty days is available to all SMBs looking for an effective spam filtering solution. There are no contracts to sign, no credit card required and no obligation on your business to purchase a license or commit to subscription once your free trial has expired. To find out more about our offer, please do not hesitate to call our team of Sales Engineers today. One of our friendly team will be happy to answer any questions you have about spam email filters for SMBs and guide you through the implementation process for starting your free trial. Once your medium sized business anti spam filter has been configured, you will be filtering your incoming and outgoing emails within minutes.